One of my favorite things about the world of shooting sports is the incredible amount of variety out there. From USPSA to long distance precision rifle, from cowboy action to benchrest, from 3 Gun to steel challenge, and so many others… There are a lot of different competition formats to cater to a lot of different interests. Not too long ago I got to attend a Falling Steel shooting competition. I’d best describe it as a USPSA match with only steel targets that must fall over to count. 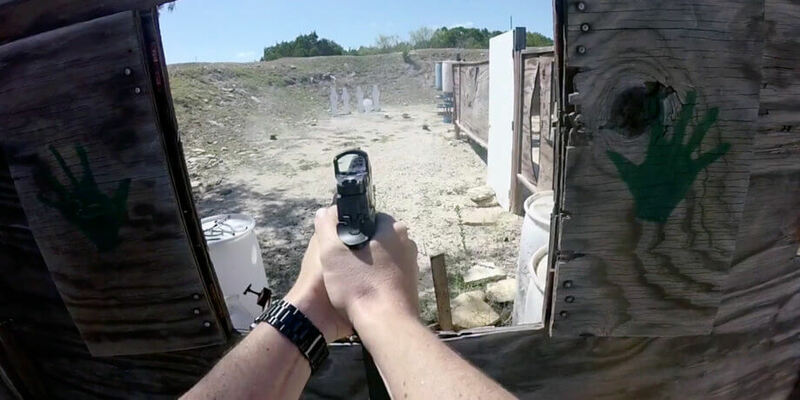 At the Copperas Cove Pistol Club monthly falling steel match, each stage is comprised of three shooting positions with nine targets at each position. There are three stages, and we run through each stage twice – the first time we have a 30 second par time (most shooters don’t make par) and the second time through we shoot until the targets are down, or the mags are empty. For the first run through, steel targets left up have a two seconds penalty each and the second run through the steel targets have a five second penalty. Divisions are broken out based on IDPA/USPSA rules, but all handgun magazines are capped at 10 rounds. The magazine capacity paired with the par time and penalties creates an interesting strategy within the stages that I’ll get to in a moment. Honestly… I wasn’t extremely happy with my performance at that match. I didn’t care about placement or anything at that match (I didn’t even look it up) since it was my first match with that shooting competition format. However, I wasn’t happy with my own performance. I felt sluggish all day, particularly with acquiring the dot and putting it on target. I usually shoot faster than that. But oh well, I know what I need to train thanks to this match. As I always say, the only bad match is the match you don’t learn anything from. I’m only posting video from my second run through as the two run throughs are pretty much the same, the second runs are simply more complete. Right off the bat, I draw to the far left steel when I’m going to be shooting right to left. Not a great start, but a minor mistake in the grand scheme of things. Clean runs on the first two positions, albeit a little slow. At the third and last position, I shot it all wrong. I should have saved the popper for the last target, giving me more ammo in the gun to make up for misses on the moving target. I then shot the moving target in all the wrong order, but managed to shoot just fast enough to keep it from flipping end over end quickly. That third string highlights the importance of accuracy and being strategic with the order. If I had missed on the previous shooting position, I would have only had 10 rounds in the gun instead of 11, which would have resulted in a flat footed reload. Or if I had missed one more time on that spinning target, I would have had to do a flat footed reload while it picked up momentum spinning. Saving that popper for last would have given me one extra round in the gun for makeups. This one was almost a perfectly mirrored stage. There are two shooting positions to the left and the right, with some targets hidden by barrels. Some shooters went alway to each far end to shoot the targets, which is farther than you needed to go, adding extra steps. You only needed to take one or two steps to the left/right of the start barrel to see all the targets in the stage. From there you ran forward to the red box to engage the moving and the not moving Texas Star. You could only engage the Texas Stars from those shooting positions, none of the other steel for safety reasons. I had a real bad run on that Texas Star – like I said, I was having an off day. I ususally clear Texas Stars with one or two misses. Those mistakes would have resulted in me having to do a flat footed reload for the unmoving Texas Star, but I got lucky and had one of the plates fall off without my shooting it. Stage three was by far my worst stage. It was very hot that day, triple digits, and we were quite tired. Sometimes the environment is the extra stage of the match. I should have cleared that plate rack faster, and went to slide lock after the first position, meaning I had 10 rounds instead of 10+1 for the second position. I then had poor accuracy on those poppers and needed a flat footed reload. I opted to not reload when moving to the last position, ending up at that stage with 9 rounds in the mag instead of 10+1. I only had 4 magazines on my belt, and I didn’t want to run out of ammo resulting in 5 second penalties per target. That final moving target was quite challenging. I used a mostly good strategy for it. Like the Texas Star, you want to start at the top and work your way down. Starting at the bottom and working up results in an uneavenly balanced target, which gets it really swinging. However, when I had to do that reload and the bottom final target got swinging, I should have cleared the three targets on the right, giving it time to settle down a little bit more, which would have probably resulted in less misses. Still, not bad given it was my first time shooting that particular moving target. Magazines are capped at 10 rounds, but you can start the match with 10+1 in the gun. Since each of the three shooting positions have 9 targets, accuracy is very important. There are no C or D zones, there are only hits or misses. If you shoot smoothly and cleanly, it’s possible to always have 10+1 in the gun after a reload. But misses are penalized heavily through natural stage design thanks to flat footed reloads running out the clock. A clean run would have maybe one miss at the worst at each shooting position for no slide lock reloads, which means you still have one round in the pipe when you reload when running from position to position. That extra round is quite helpful at the next shooting position to make up for misses. The 30 second stage par time really messes with your mind, probably more so than the buzzer. People rush shots (I did too) to try and blitz through shooting positions to meet that par time. Thankfully, the stages are pretty simple so there isn’t as much route and angle strategy like there is in other shooting competition formats, like USPSA or 3 Gun. Simply run from each position to each position and clear the targets as you see them. However, unless you’re really fast, if your magazine runs empty, it is better to leave those targets behind and perform a moving reload while moving to the next position instead of performing a flat footed reload while the clock is running. Since penalties are only two seconds, and that 30 second par time comes up quickly, it’s generally better to move to the other positions to knock down more targets than it is to completely clear the first position and leave the entirety of the third position. For some perspective, I’d guesstimate that around 75% of shooters take over 30 seconds on a stage. Some of the really fast shooters could perform a flat footed reload and still clear the stage within the 30 second par time, but there aren’t many who can. What is constant, is if you’re moving from one position to another, reload. Arriving at a shooting position with a partial mag guarantees a flat footed reload, eating up the clock. The second run through removes the par time, but missed targets add five seconds instead of two seconds. This is where you want to take the time to clear all of the targets, even if it means a flat footed reload. But don’t rush your shooting so you end up with that flat footed reload. As a general rule, a good, consistent cadence with solid hits is better than shooting quickly and hoping for the best. But that’s true of any competition format really. This falling steel shooting competition format is an absolute blast. Shooting steel is always fun. Falling steel is even more fun. And a complete stage of 27 falling steel targets, including moving targets, is incredibly fun. It also emphasizes different skills compared to other shooting competition formats, so it really helps shooters become well rounded. I’m pretty sure this match is going to make it into my monthly rotation.